Wrapped - up with a dialogue form meditation on the Stations of the Cross. Target group: priests, deacons, religious, novices, lay youth leaders and spiritual teachers. 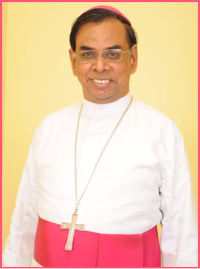 Pitcharan is an active and committed member of my Diocese who has been voluntarily giving ‘Adult Catechism’ training to our youth for a few years now. He has recently developed a course on Divinity which is about ‘getting fit to live with our Father in Heaven’. The content for this course has already been published as a book earlier this year (THE NARROW WAY, ISBN 978-1-4828-4756-7), after being granted Imprimatur by me. I am pleased to endorse and recommend this course which is now being conducted by him in some of our Parishes.